Summary: Rachel takes the same commuter train every morning. Every day she rattles down the track, flashes past a stretch of cozy suburban homes, and stops at the signal that allows her to daily watch the same couple breakfasting on their deck. She’s even started to feel like she knows them. “Jess and Jason,” she calls them. Their life—as she sees it—is perfect. Not unlike the life she recently lost. Review: What a gritty, uncomfortable little thriller this turned out to be. 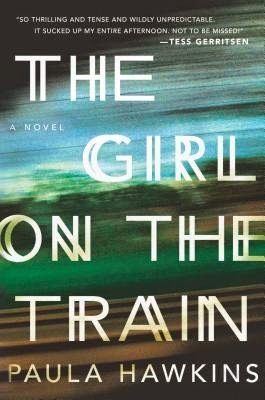 I actually wasn't sure what I would think of the book, because it's being compared to Gone Girl, and to be honest, I avoided Gone Girl because it just did not sound like something I would enjoy. This book got my attention right from the beginning in the summary, though, and that continued throughout the book. I'll admit that this book surprised me - I didn't expect bits of it to be as harsh as they were, or as difficult to read. The story unfolds through the eyes of three narrators - Rachel, Anna, and Megan. To be honest, none of these women are particularly likeable in various ways - all of them have their weaknesses, their flaws, and sometimes they are downright uncomfortable to read about, if I'm honest - Rachel in particular, for me. This isn't a book that's about making you fall in love with the main characters, this is a book that weaves their lives together and builds suspense and makes you want to know more about what binds them together. Once you get into this novel, what you get is a surprisingly intriguing mystery that weaves the three lives together and brings everything together in a climax that I honestly wasn't initially expecting. There were some moments where I just thought 'Damn...' because that is the appropriate reaction to the events going on! It's a character study, a mystery and a thriller all at once, and if it doesn't prove to be immensely popular I will be very surprised. I definitely recommend checking out, though with a warning - give yourself some time, because once you hit the midway point you won't want to put this down!